Although often attributed to a certain 'Nennius', the 'Historia Britonum' ('British History') is not the work of a single author but a compilation which grew by accretion--one series of legends after another added to the original core--and was repeatedly rewritten over several centuries. Modelled after Irish chronologies and containing much fabled material, it offered the only history of Wales in early medieval times. It was attributed to both Nennius and Gildas to give it intellectual authority. Geoffrey of Monmouth drew upon it for his 'History of the British Kings' because it preserved ancient stories and legends of the British. Also, it contains the earliest mention of the name Arthur in its stories of an early British king. This manuscript is the most complete copy. On the first page, an encapsulated world history called the 'Six Ages of the World,' provides a broad framework in which the reader might try to set the variety of material on Britain which follows. 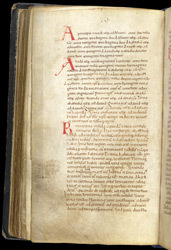 The large letter 'B' halfway down the page begins a section on the origins of the British and Irish, together with a geographical description. It begins, 'The island of Britain is so called from one Brutus, a Roman consul.' Brutus was the fabled first king of Britain or Albion and, in later medieval romance literature, he became the basis of Layamon's 'Brut'.